Data direct from weather station. Click to view full size image. January 2017 started out with nearly normal temperatures for the first few days. By later in the first week of the month a strong arctic air mass coupled with a strong upper level jet dropped temperatures drastically for a decent period of time. High temperatures struggled to reach the 20’s and multiple below zero readings were recorded for the Castle Rock area. 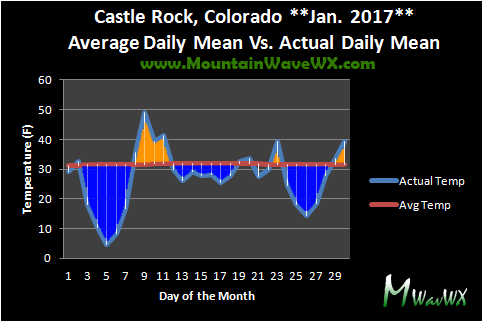 After that storm system the Castle Rock area saw a moderation of temperatures followed by more arctic air in the middle of the month and another push of strong arctic air towards the latter half of the month. Daily mean temperatures for Castle Rock Colorado. Mean temperatures are an average of high and low temps for that day. 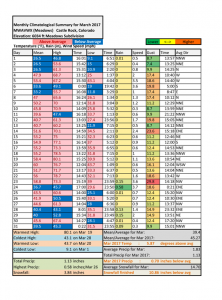 Temperatures swung back and forth throughout the month, with the warmer periods in between cold outbreaks due mostly to chinook/down-sloping wind systems over the front range. We didn’t see a strong ridging establish so warm air had a difficult time gaining a foothold in the state. In addition, lack of upper ridging meant arctic fronts were invading the state quite often, while none of these had a ton of moisture for the Castle Rock area, the temperatures observed during these events was very chilly. 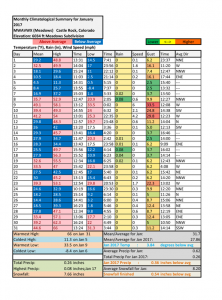 As you can see from the chart above, there were more below average days and the intensity of them was enough to x-out any warming effect. As such, January 2017 finished as a moderately chilly month! 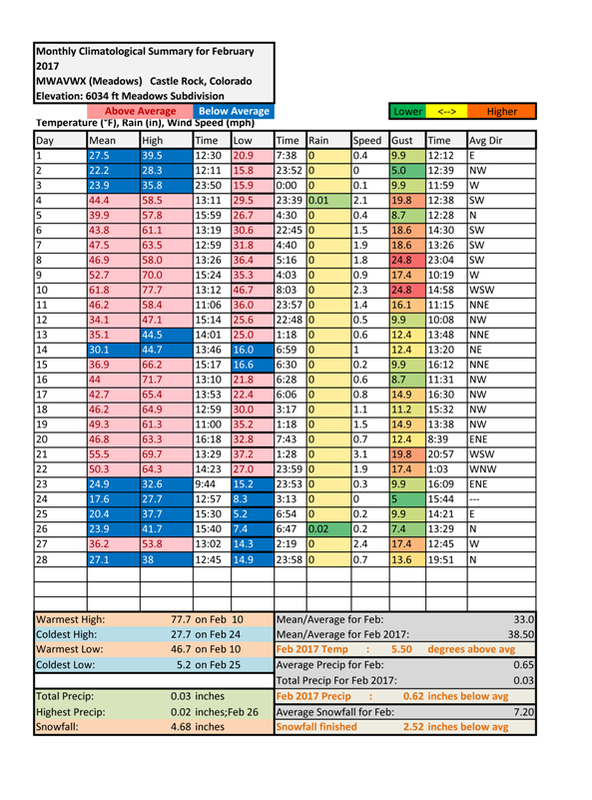 Snowfall was just slightly below average for January 2017. January is not typically one of our snowier winter months, it is often remember more for its cold temperatures than large snowfall events. The image above shows the two main snow storms we had, neither of which was that impressive. We had a slight dusting on the 25th as well, but overall despite the strong systems and cold we didn’t squeeze much moisture out of any of them in Castle Rock. Areas North of Denver saw the most impact from these storms and many of those areas finished above average. Total liquid precipitation for Castle Rock finished at 0.26 inches which is 0.36 inches below average. Snowfall for Castle Rock finished at 7.66 inches which is 0.54 inches below average. Despite the coolness and lack of ridging we experienced in January, models have been pretty consistent with bringing strong ridging and much warmer than average temperatures for most of the Western U.S. for at least the first half of February. 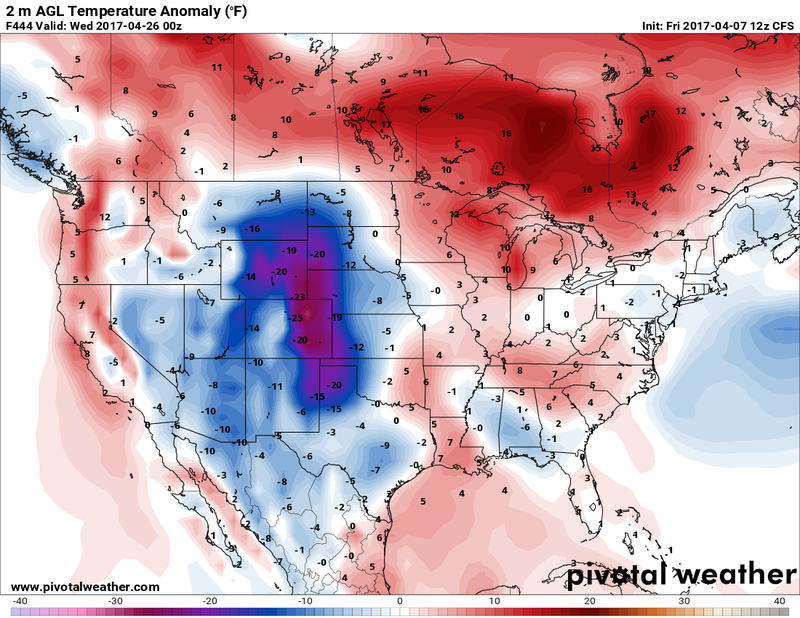 The GEFS long range ensemble shows a quick shot of cooler air around the Feb 7-9 time-frame but after that it shows the pattern we see above. Notice the strong ridging bringing warm temperatures to the Western U.S. while the Eastern half of the country remains cooler. This transitions to nearly all above average by later in the month so February 2017 could end up warmer than average for many locations in the U.S. but the highest odds will be in the Western and Southern parts of the country. 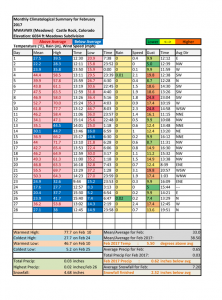 The CPC 1 month outlook confirms this, showing a much higher probability of higher than average temperatures for February 2017, especially in the West. 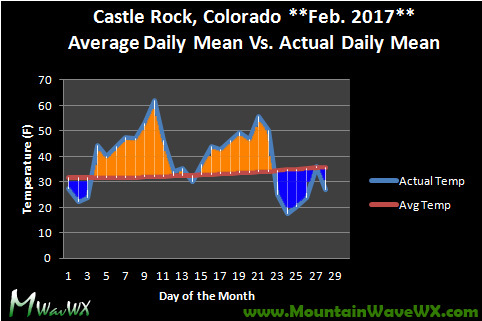 I predict Castle Rock will finish above average on temperature and average to slightly below average on precipitation/snow for February 2017. 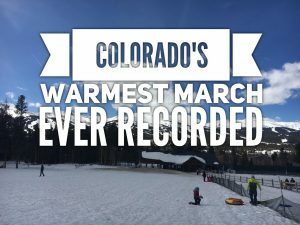 March is one of the trickier months of the year to forecast in Colorado but often one of the most fun. 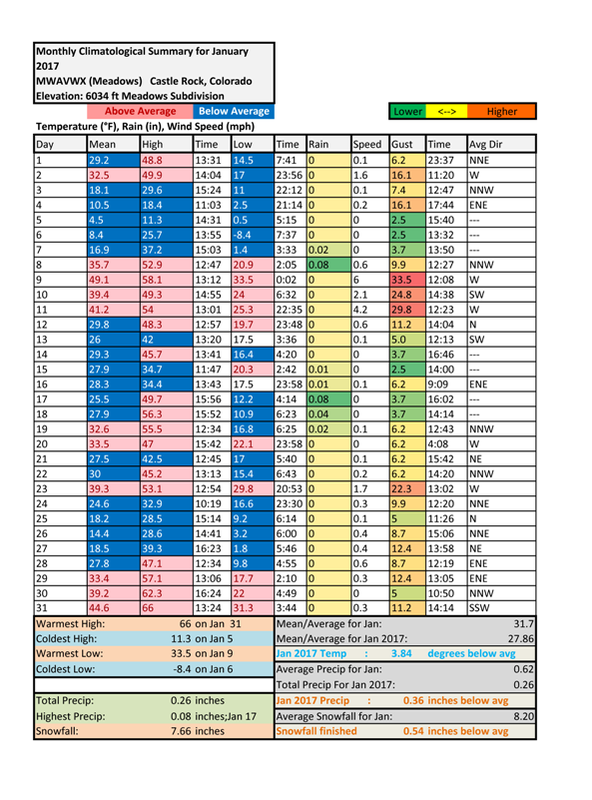 It is not a surprise to see a single day in March feature weather from all of the season; everything from strong winds, hail, snow storms (including city-crippling blizzards) and even tornadoes are possible in March! What does March look like this year? Oranges, yellows and reds are higher than average sea surface temperatures. Blues and greens are lower. We are currently transitioning out of our La Nina pattern into a more neutral state in the ENSO region. How fast this happens may determine what our March looks like, it may also influence April and May as we move into those months. Should we remain neutral through the month of March, we can expect variability in our weather but we don’t necessarily get a guarantee of a big “drought busting” snowstorm or blizzard. You can see on the image above (from Feb 27) we have transitioned almost completely neutral (denoted by the lack of colder water in the ENSO region of the Pacific. You can also just barely see the warming of the water near the South American Coast along the Equator, this could be the beginnings of an El Nino event. The CFSv2 puts a strong bias on a moderate/borderline strong El Nino by the summer months. If we put it into motion we can see the warm water spread from the coast of South America as we move into summer. What Does This All Mean for Colorado? The GFS and CFS both show a lot of splitting in the jet stream for a good chunk of the month. This often means slightly above average temperatures along the front range but not good chances for moisture. Don’t be surprised if the first half of March starts off warm and very dry. Models show a few troughs here and there but nothing ever seems to get too organized with a split flow dominating most of the month. The second half of the month looks a bit better, but I honestly don’t see much to get excited about if you’re hoping for a large snow storm or a lot of moisture in March. My prediction for March; slightly above to well above average temperatures with below average precipitation. I just don’t see March drawing off the El Nino setup soon enough, I do like our chances for a wetter April and May though! As we move into March the region moves into one of the more interesting time periods of the year for weather. March begins the season meteorological spring, this season is characterized by huge swings in temperatures, snow storms, ice storms, hail, tornadoes and everything in between. 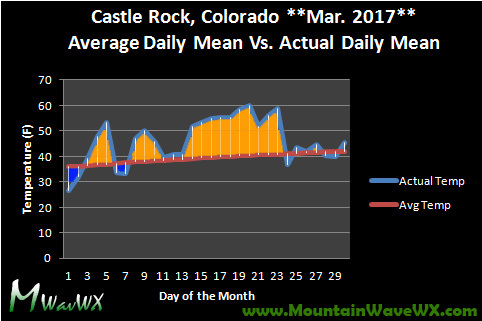 The Castle Rock area experienced some interesting weather swings this March and while we often recorded our snowiest month during this time, snowfall was overall pretty abysmal for March 2017. 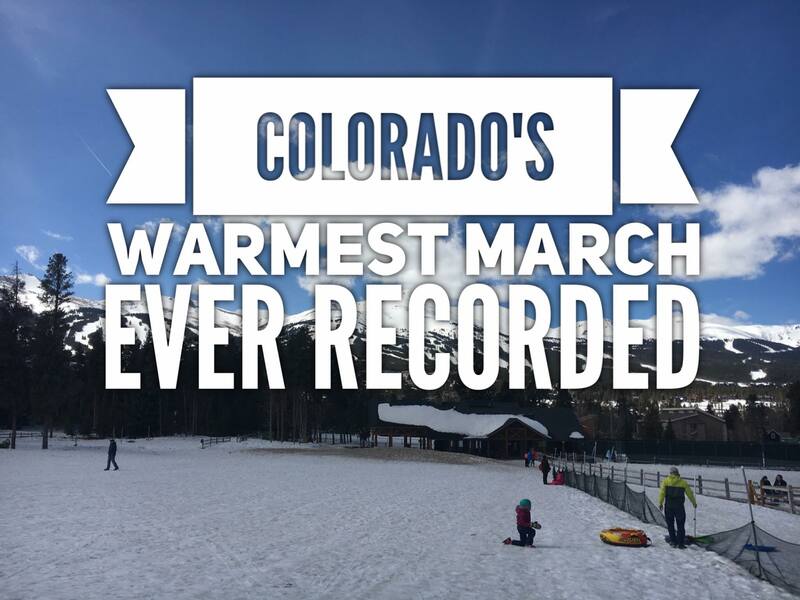 On another note, the state of Colorado as a whole recoreded its warmest March ever recorded since records began. Did Castle Rock’s temperatures contribute to this trend? Let’s take a look! March 2017 continued our trend of above normal temperatures for the region. Castle Rock and many areas surrounding Castle Rock recorded some of their warmest March average temperatures in history. We saw a cool start at the beginning of the month, followed by a brief dip towards Normal at the end of the month. Between those two slight dips it was all warm temperatures. 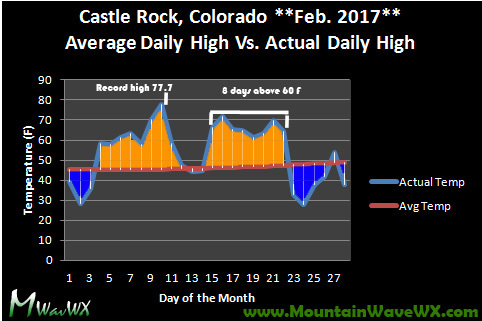 This is the second month in a row Castle Rock Colorado has finished more than 5 degrees above average, quite a statistic! In what is usually our snowiest month, we did not see much of anything for March 2017. Any storm systems that did make it through left more rain that snowfall, but even with the rain it was not enough to help March 2017 finish as anything but extremely dry. Total liquid precipitation for Castle Rock finished at 1.13 inches which is 0.70 inches below average. Snowfall for Castle Rock finished at 3.84 inches which is 10.86 inches below average. 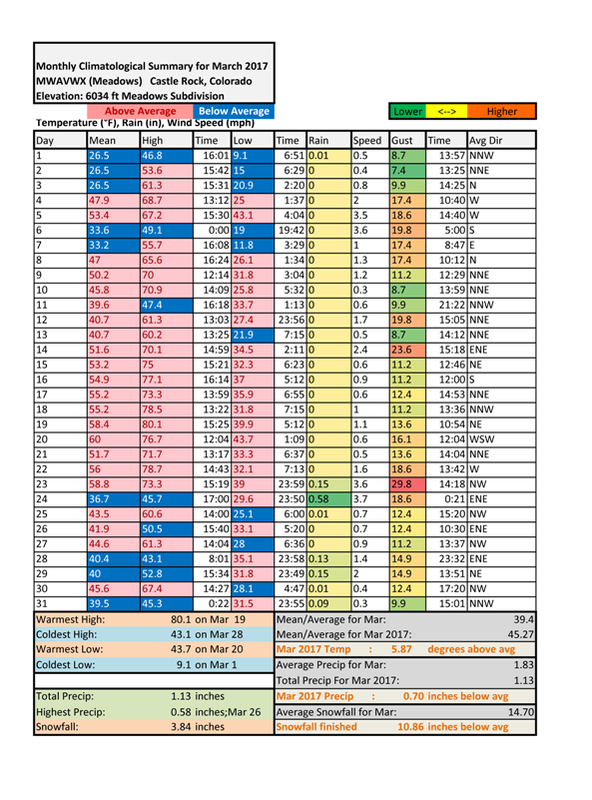 When I look at the long range data for April, I see a lot of similarities to March. The first half looks rather warm and relatively dry with some inklings of a change somewhere in the middle to second half of the month. 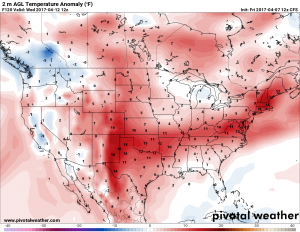 First half of April looks warm for most of the U.S. 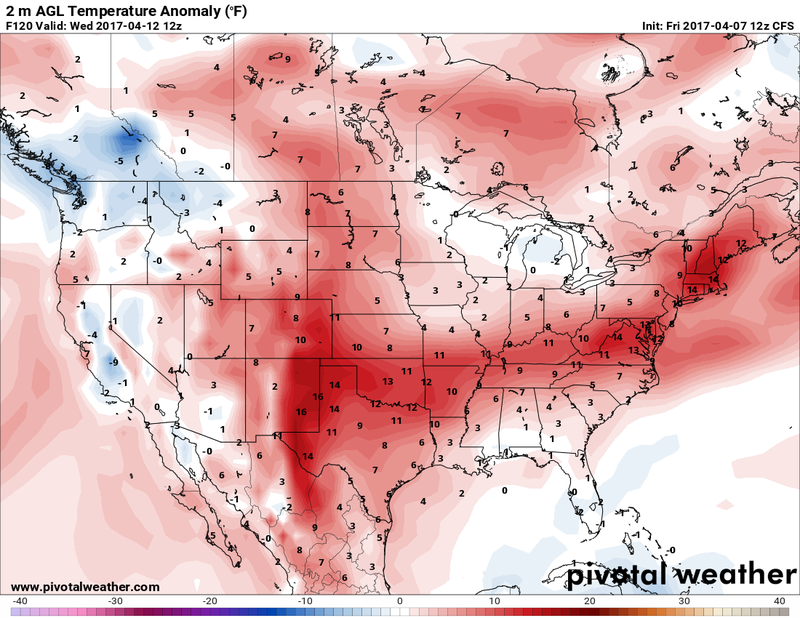 The temperature anomaly images above show what the CFS model believes temperatures will look like throughout the month. 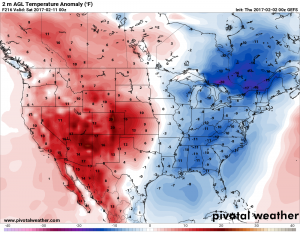 The numbers represent how many degrees above or below average this particular model is expecting and the GFS is pretty consistent with this. 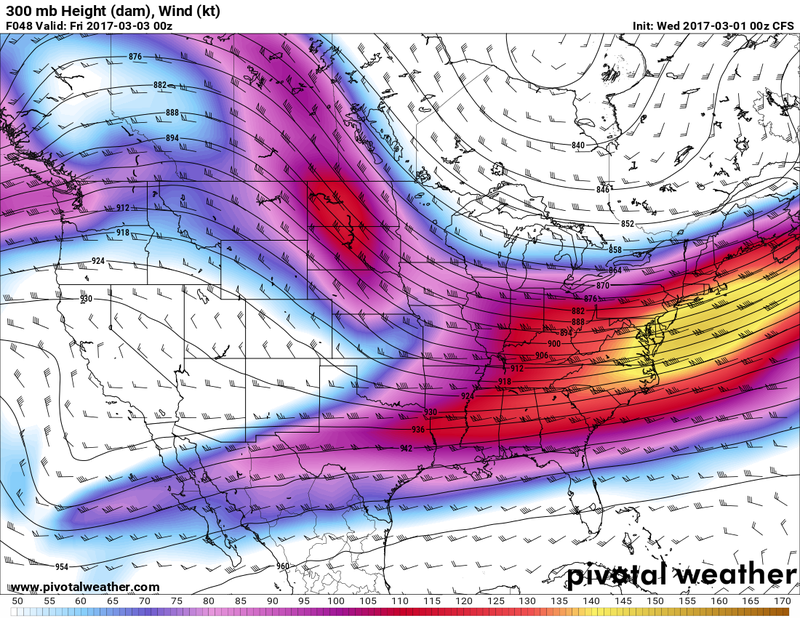 I’d be keeping an eye on the plains for severe weather as these storm systems move through, the positioning of the jet stream combined with the moisture and heat available could make things pretty active. My prediction for April; expect temperatures to finish above average with near to below average precipitation. El Nino is beginning to establish itself in the Pacific and that means we could see a decent weather pattern change coming in the near to medium term.